We discovered that human brains can detect Earth-strength magnetic fields. A pattern of brain waves shows that we are subconsciously processing geomagnetic stimuli. 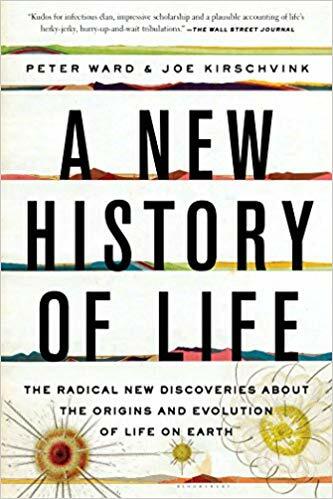 We’ve known about the five basic senses: vision, hearing, touch, smell, and taste since ancient times, but this is the first discovery of an entirely new human sense in modern times. In future studies, we want to know what a magnetic sense does for us. Here on Earth, we live surrounded by an ever-present geomagnetic field that varies in intensity and direction across the planetary surface. 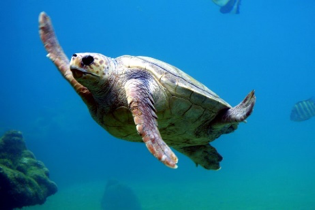 Many species, from bacteria to algae to animals, can sense this field and use geomagnetic stimuli to navigate and survive. 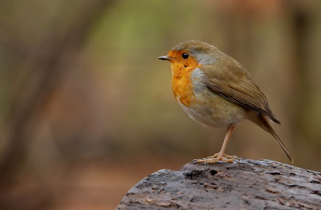 Some birds migrate over thousands of miles using the field to keep track of where they are and where they are going. 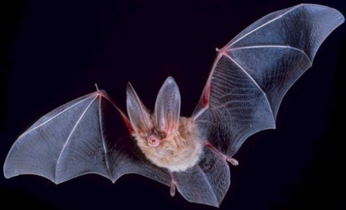 Other birds, mammals, reptiles, and fish home to specific locations through geomagnetic cues. A magnetic sense allows burrowing mole rats to navigate underground mazes in total darkness. Billions of years ago, magnetotactic bacteria evolved the ability to precipitate crystals of the iron-based mineral magnetite in their single cells. 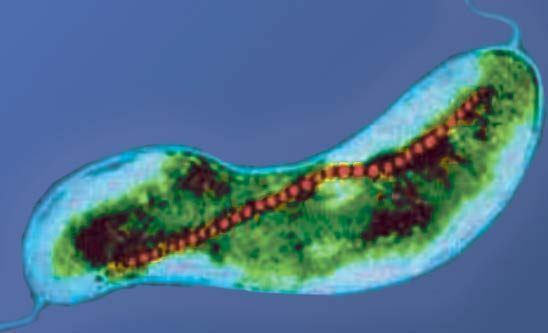 Lining up in chains, magnetite crystals formed the physical basis for magnetoreception, acting as compasses to align the bacteria swimming direction along the local magnetic field lines of the Earth, allowing the bacteria to move along a straight line, rather than tumbling chaotically, as they seek out nutrients to grow and multiply. 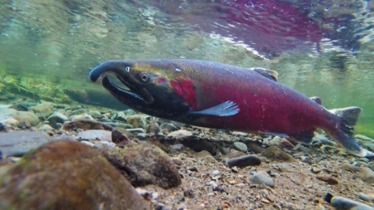 Magnetite has been found in many animals, ranging from the teeth of mollusks (the Chitons) to specialized cells in the snout of rainbow trout. In humans, magnetite crystals are widely distributed across many areas of the brain. To find out, we built an experimental chamber to apply a controlled magnetic field, then used electroencephalography (EEG) to test humans for brain responses to field changes. EEG records brain electrical activity and reflects information processing in many interconnected neurons. It is an ideal tool to study subconscious processes in which physical stimuli are picked up by the brain but do not enter conscious awareness. 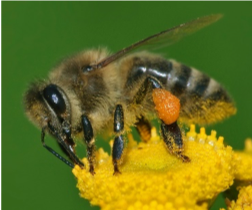 This happens with all sorts of sensory stimuli, which can influence our cognition and behavior without us ever knowing that we saw, heard, or felt anything new. 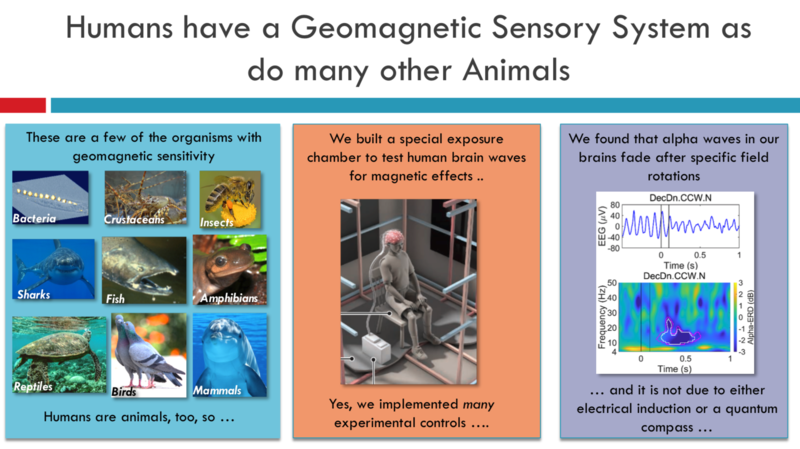 We thought that geomagnetic stimuli might be processed this way, so we looked at human brain waves for any signs that we, like our evolutionary relatives, have a magnetic sense. Do humans have a magnetic sense, too? 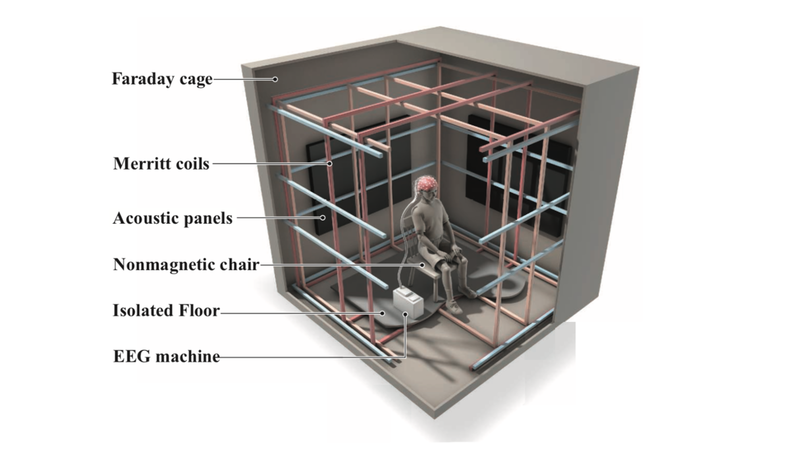 In our experiment, the participant relaxes in an extremely comfortable chair inside a radiofreqency shielded test chamber. 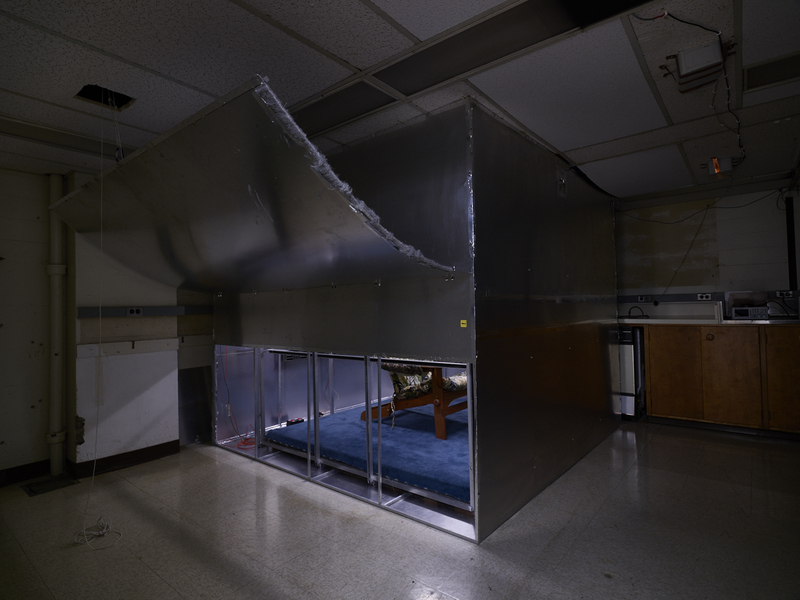 Inside the chamber is a set of large square coils, setup along three different directions (up/down, E/W, N/S) through which electric current flows to generate an Earth-strength magnetic field within. 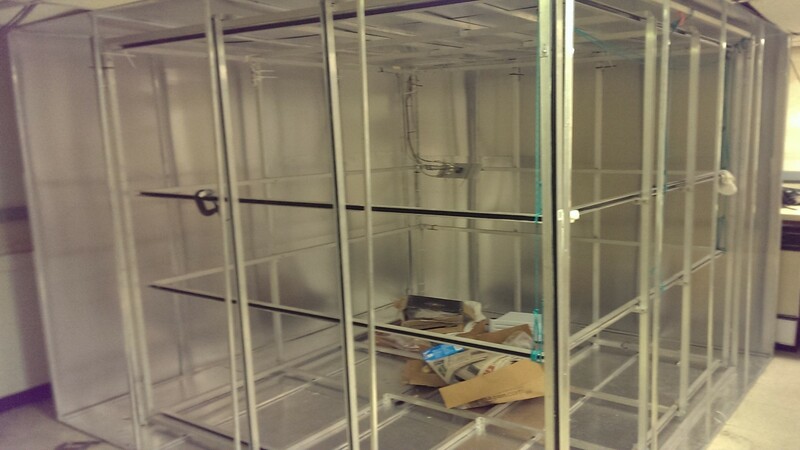 Image by Spencer LowellFaraday cage with 3 axis double wrapped magnetic coils in Joseph Kirschvink’s lab at Caltech. 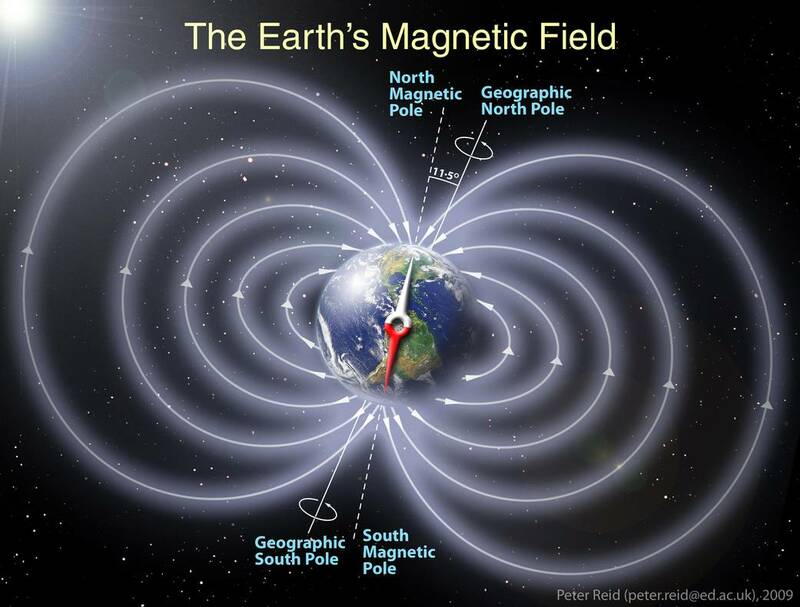 The field can point in any direction, whether Up, Down, North, South, or anywhere in between, and can simulate the local magnetic field in the Northern or Southern Hemisphere. The field is very weak (35 microTesla), comparable to what we experience in our laboratory outside the test chamber, and 100,000 times weaker than in a research MRI (4 Tesla). We can vary the magnetic field direction or intensity over short time intervals of 100 milliseconds (one-tenth of a second) while recording EEG to see if brain activity changes in response to a changing magnetic field. While our human participants sat doing nothing with their eyes closed for about 7 minutes, we changed the direction of the magnetic field at irregular intervals, up to 100 times throughout the experiment. Each time, the field rotated clockwise (CW) or counterclockwise (CCW), analogous to turning your head left or right but without actually moving. The whole time, the field pointed steeply downwards (60-75° from horizontal) like the Earth’s field in mid-latitudes of the Northern Hemisphere, where most of our participants were born and raised. By comparing brain waves following field rotations with brain waves in control trials when the field didn’t change (FIXED), we can spot an EEG difference indicating that the brain is processing geomagnetic stimuli. After a downwards magnetic field rotated counterclockwise, some people responded with a large drop in amplitude of their EEG alpha waves, up to a 60% decrease from pre-stimulus levels. Alpha waves are EEG oscillations that go up and down at a frequency around 10 Hz (10 times per second). They dominate the EEG signal when we are awake with our eyes closed, and arise from the spontaneous, synchronized activity of millions of neurons. Their function is not well-understood, but they may reflect a relaxed mind with nothing in particular to focus on and no particular task to do. When a stimulus suddenly appears and is processed, neurons fall out of synchrony with each other, the alpha rhythm is disrupted, and alpha waves get smaller as a result. Several trials of EEG recorded over 64 channels at different positions over the surface of the head. Alpha waves around 10 Hz dominate the signal. 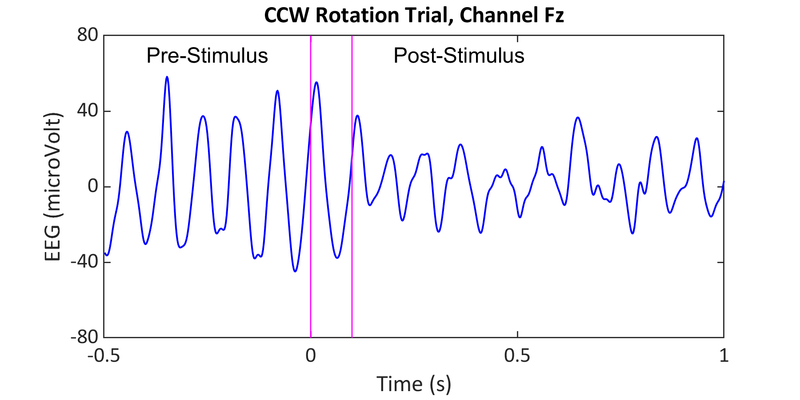 Pink lines indicate the onset of magnetic field rotation in CW and CCW trials. In control trials labeled FIXED, the magnetic field doesn’t change. 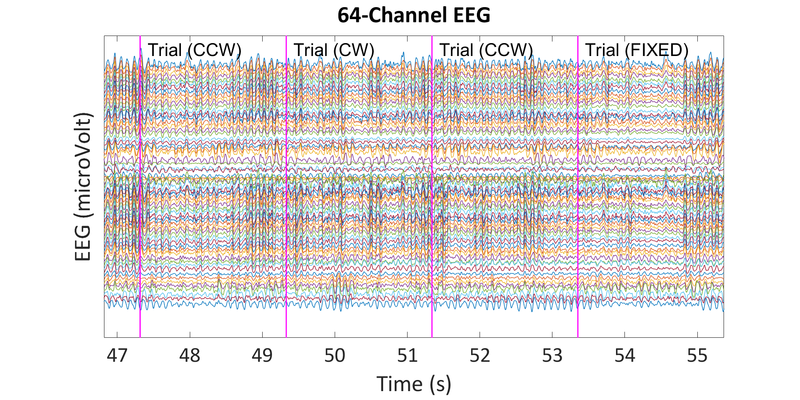 EEG from a single channel (Fz) centered over the top of the head. Pink lines show the 100 millisecond CCW rotation. Large alpha waves in the pre-stimulus period get smaller following the field rotation. This phenomenon is called alpha event-related desynchronization (alpha-ERD). In cognitive experiments, it happens during many visual tasks, a few tenths of a second after a stimulus pops up. It is greater during hard tasks, like finding an object in a cluttered scene, than easy tasks, like noticing a flash of light. Alpha-ERD is an indicator that the brain has picked up a stimulus and is doing something with it. Schematic showing the magnetic field rotations used in the experiment. 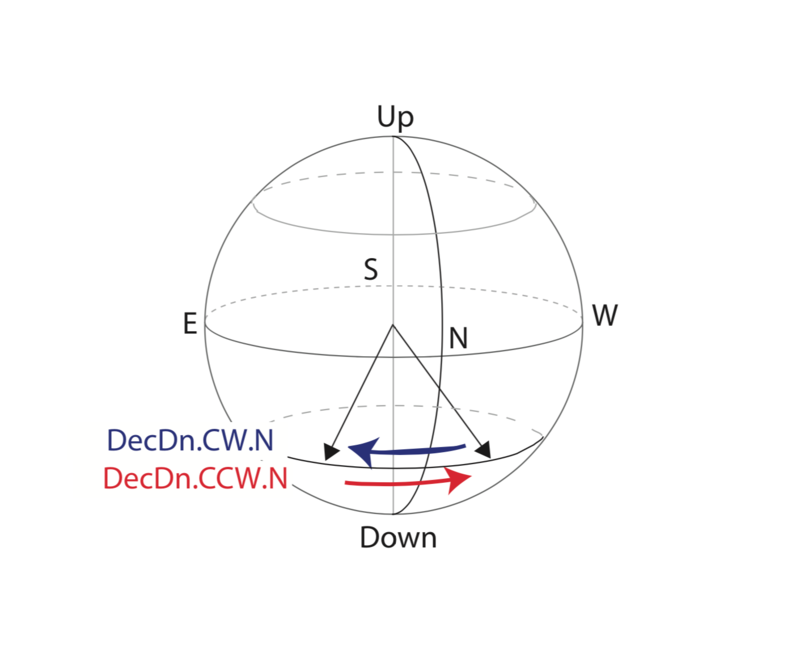 The participant sits facing North, while the downwards-pointing field rotates CW (blue arrow) from Northwest to Northeast or CCW (red arrow) from Northeast to Northwest. Topography of alpha wave amplitude changes across the surface of the head at 500 milliseconds (half a second) following magnetic field rotation. After the CCW rotation, alpha waves dropped in amplitude, as shown by the deep blue color covering much of the head. Alpha waves didn’t change much from pre-stimulus levels after the CW rotation, or during FIXED controls when the field didn’t change. Black dots show the positions of the 64 EEG channels. Pink and white outlines show statistically significant clusters of channels at the p<0.05 and p<0.01 thresholds, respectively. In our experiment, alpha-ERD shows that the human brain can detect Earth-strength magnetic fields, demonstrating that we have a sensory system that processes the geomagnetic field all around us. Potentially, we and/or our nomadic hunter-gatherer ancestors could use a magnetic sense to navigate and survive. What causes Frost and Freezer Damage to Foods?